Laurie was the perfect person to marry us. She gently guided us through a maze of relationship questions. The questions evoked answers that were perhaps never spoken until that evening. Chris and I love the comedy, "Princess Bride." There is a scene in the movie with the speech-impaired priest, "Mawwage. Mawwage is what bwings us togethew today. Mawwage, that bwessed awwangement…” Laurie was open to trying something new, unorthodox and she went above and beyond the call of duty playing that role for the introduction of the wedding. She beautifully integrated our deep love for each other with our strong belief that humor is vital in a relationship. She reflected us. 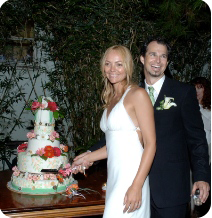 Thank you, Laurie, for making our wedding day one of the best days of our lives. 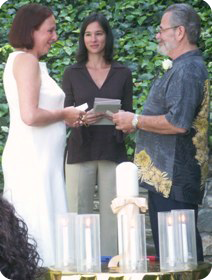 Your attention to detail, warmth, sense of humor, and insatiable curiosity, make you a very special officiant. You are a magician, a sorcerer who spun her magic spell over our wedding and created the most wonderful event we could have ever desired! You brought so much heart to our ceremony that every person attending commented how beautiful and moving the ceremony was. When we stood before our friends and took a moment to notice their presence, we saw their total involvement in the event. You had our attention and theirs. You fully engaged us in the ceremony and somehow fully engaged every member of the audience. Yet, you never got in the way. This was a service about US and you made it that way. Thank you. Your presence and your presentation brought elegance, dignity and beauty to our event. I doubt that any of us will understand how you created this atmosphere for us, yet allowed the ceremony to be about us. I was amazed, as you stood before us and captured us with your eye contact and your interest in the moment, how you riveted all of us with the clarity and power of the words as you spoke them, the compassion in your voice and your soul. You engaged us. You guided us. You made our wedding a beautiful event. Person after person told us how touched they were by the ceremony and by you; these were not cursory comments,these were earnest statements of marvel at the spell you weaved. This is the first wedding we have experienced at which a very nice reception was icing on the cake of a truly wonderful ceremony. We shall be forever grateful for the gift of your participation in our wedding. 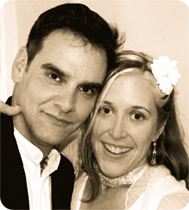 Laurie Merrill married us in September of 2006. Like many, we were excited and very stressed over the production of such an special event. Laurie soothed us with her sensitivity, patience and professionalism. She composed and performed the perfect ceremony in both duration and content with the words that spoke to us as if they were our own, only clearer and more eloquent, blending our different backgrounds together beautifully. Countless wedding guests praised her for her grace and delivery. Many of our friends and family were saying that it is often hard for the bride and groom to fully enjoy and even remember their wedding ceremony. For us, time stood still and we managed to absorb every moment of the love and support that surrounded us. Laurie was a big part of that because she fit so well with our wedding party and she guided us with confidence through process. We could not imagine anyone else presiding over what was the best day of our lives. We always refer to everything related to our marriage as perfect. The whole experience went flawlessly, from pre-ceremony to parties. We couldn’t have asked for better. Most important was the ceremony itself. We could not have had a better officiate than you. The minute I talked to you I knew that this was a match, and when we met, I could see that Lee felt the same way. We instantly liked you, and we knew you were the right person to marry us. We were thrilled to be your first. 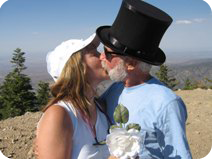 You are a great hiker - it was almost impossible to find someone who would hike to the top of a mountain to marry us, let alone someone we really liked and felt comfortable with. We loved that you were as excited as we were, and that you were serious about what you were doing, and cared as much as we did. You were flexible and easy to work with, especially considering our unusual circumstances. We loved your extra touches — the way you printed the text and book you read from, helping us by taking terrific photos, and baking the wonderful cookies to add to our picnic lunch. We enjoyed them again after the party, but only shared them with a select few (we wanted plenty for ourselves!). We know you’ll be successful as a wedding officiate, and that many other couples will also have a perfect wedding, as you add your special touches to their ceremonies.